Their top three reasons were to provide better service for existing customers, attract more customers locally, and to gain the advantage over other businesses around them. Yoga studios are no different from other small businesses in the impact that can be seen from having a mobile website. If your yoga studio is part of the 61% of small businesses which do not have a mobile website, you are also missing out on the business from the many smartphone users who are trying to find you with their device. It’s important to understand some differences between a regular desktop website and a mobile website. A mobile device, such as a smartphone, has a much smaller screen. A mobile website is optimized for a smaller viewing field. It can be frustrating for a mobile user to try and view a normal website on a smartphone, and when an experience is frustrating it isn’t likely to be repeated, and business is lost. Another difference between a website for PC and one for mobile is the bandwidth. Mobile users often have slower networks than one that a home PC is connected to, and this will contribute to frustration levels when a mobile user attempts to visit a PC website. A mobile website will have reduced bandwidth to accommodate mobile users. A mobile website will often have increased readability with a larger font size, and an increase in the size of clickable areas, since clicking is not as precise with a smartphone. Since most mobile devices include a phone, a mobile website should include a click-to-call button. This is a great benefit for a yoga studio. As soon as a potential client accesses your website and has a question about a class or other aspect of your studio, all they have to do is click on your click-to-call button and their smartphone will instantly dial your studio. Perhaps the best part of a mobile website for a yoga studio is the capability of on- the-go clients to find you anytime they want. A mobile website with your address, a map and driving directions helps new customers and newcomers to your area find your studio easily. A class schedule on your mobile website means that a busy client can look up classes from anywhere at any time, giving them many opportunities to stop in before or after work, on their lunch hour, between meetings or in the middle of errands. 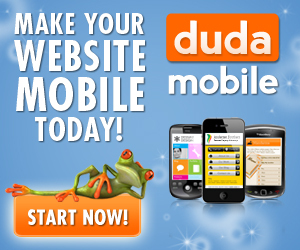 DudaMobile is a great place to go for help in building a mobile website for your yoga studio. DudaMobile boasts one-click conversion and easy management. They offer free services as well as custom services for a fee. With Duda Mobile, you can manage your mobile website with features such as free analytics, advanced design studio and great looking templates. DudaMobile is also WordPress friendly. There are quite a few of mobile marketing companies, but before you decide on a fitness marketing plan, Sign up for our FREE mobile marketing training below. There is no doubt that mobile marketing is the new future of marketing as we know it. As a fitness business owner in Canada , you must start to learn more about how these new mobile marketing trends will help your organization. Are you considering how to create mobile apps for your healthclub? Do you think that SMS marketing software is right for your gym? If you own a healthclub or yoga studio in Canada, take advantage of our FREE MOBILE MARKETING TRAINING VIDEOS by Signing up Below!